“I have one dollar that says this play is good,” joked sophomore Brendan O’Hagan as we drove down the Great River Road to Jacoby Theatre in Alton. Regardless of Brendan’s joke, there was a sense of excitement backstage from the entire cast as they prepared for Eurydice, a play written by Sarah Ruhl. The play Eurydice is about a Greek myth with a modern twist. It follows the story of a newlywed woman, Eurydice, who dies and sees her father again in the underworld. She must choose between staying with her father or seeing her husband again. As an audience member, one gets to experience the epic journey and the grief, regret and sorrow Eurydice experiences along with her. Whitney’s comments were evident as I sat in the audience and watched her completely immerse herself in the relevant and lovable young woman of Eurydice. Even the smallest of movements, a slight head tilt, the wiggling of her toes, and the furrowing of her brow, were all examples of Whitney transforming into Eurydice on stage. As a Principia alum, Whitney enjoyed easing into the professional world of acting through Bankside Theatre. “I was working with people affiliated with Principia, but also working with people who were outside of the Christian Science community,” she said. When I met with John O’Hagan, theater professor and actor in Eurydice, he said, “One of the things I love about this play is that it’s constantly revealing itself to me.” He told me about working with the cast and the comfortable balance they had of breaking the story down in the rehearsal process. 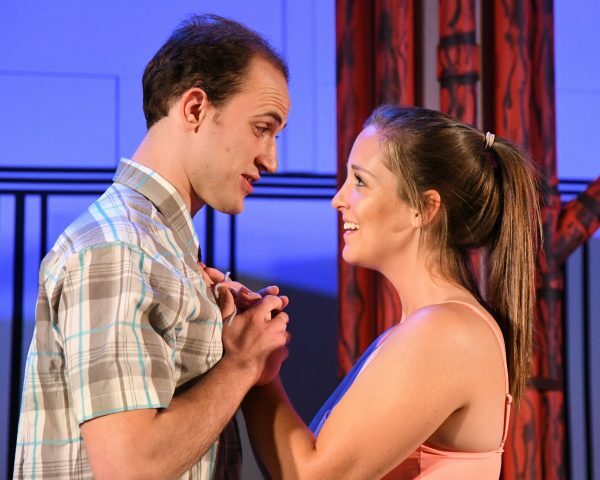 John embodied his character as a father and took the entire audience through an emotional rollercoaster as his relationship with Eurydice unfolded on stage. I asked each person what they thought of the play as a whole. I was moved by the sincerity in their answers. Director Caleb King said, “It deals with some issues that everyone deals with. It’s a really beautiful play.” Afterwards, Brendan O’Hagan described it as, “surreal, lyrical and poetic,” while expressing his adoration for the language of the play.